Ivan Michael Palmaw was born in St. Petersburg, Russia on November 19 (WWII draft card list Nov. 6), 1896. 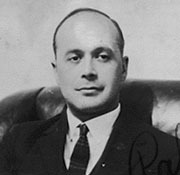 Prior to WWI and the Russian Revolution, Palmaw studied engineering at the University of St. Petersburg and finished military engineers school. Reportedly he gained valuable on-the-job experience by working for his uncle, Alexander KrAnoff (KrEnoff) the last imperial architect of Russia. After serving as an officer in the Russian Army during WWI, he was forced to leave the country during the Russian revolution, and eventually joined his uncle in exile in Shanghai, China in 1920. While working in his uncle’s office he assisted in the design and construction of several large apartments and homes. Then in 1926, for reasons unknown, he made the decision immigrate to the United States. Palmaw then entered the architectural program at the University of Washington at the age of 30. Upon graduation in 1929, he became a naturalized U.S. citizen (Sept. 27, 1930) and began working for Seattle architect, Roy D. Rogers (1930-1937). While there he was responsible for the designs of the Thomas Balmer House (1930); the Horner House (1931); L. I. Ozerkov House (1936); and the Frank Burnett House (1937). After Rogers, Palmaw opened and independent practice before joining fellow architects Frank Baker and George Stewart in a new practice (1938-40). Independent projects attributed to Palmaw during this time frame include the Willard E. Williams House (1939-40); and two traditional Byzantine style Russian Orthodox Churches, St. Nicholas (1935); and St. Spiridon (1937), both in Seattle. By 1940 Palmaw opened his own independent practice. Reportedly he designed a number of eclectic private residences in the Seattle area including the first homes in the Blue Ridge community, and most of the major substations for Seattle City Light (including the Broad Street Substation, 1950). In fact Palmaw had an extensive history with Seattle City Light. He had worked on various City Light projects as early as 1937 when he joined the architecture firm of Stewart & Baker, who at the time was working on the housing development in Diablo within the Skagit Project. Palmaw worked on the design for House #6. He designed several other City Light substations including: Columbia (1942), Magnolia (1943), First Hill (1949) and Bothell (1950). His most celebrated work is the Streamlined Moderne style Renton Fire Station (1942). In 1957 Palmaw, by then age 61, went to work for architect Harry Powell & Associates on Mercer Island. He remained at Powell until his retirement in 1969. Palmaw passed away on Mercer Island on September 1, 1979. Obituary, Seattle Times, Sept 16, 1979. WA State Architectural License - Dec 4, 1931. "New Architecture Firm" The Architect & Engineer, Vol 131-132, Oct 1937 - March 1938. "St. Spiridon to Build Church" Seattle Times, August 28, 1937. "A solarium built over the living room...." Seattle Times, November 1, 1936. "Work will start soon on the first unit of the St. Nicholas...." Seattle Times, November 25, 1936.